Traps are hidden and baited. Traps can be almost anywhere. Polly has survived 2 traps. 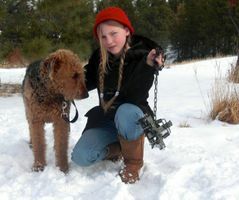 FOOTLOOSE MONTANA PRESENTS A TRAP-RELEASE WORKSHOP What will you do if your best friend steps in a trap? Learn trapping regulations, how to avoid traps, first aid, hands-on practice opening traps, what to carry with you to save your pet.